Sufjan Stevens can be so earnest…..There he is, singing to you – just you – in that sweetly tremulous falsetto, and then suddenly boom! Gigantic orchestral interludes swoop down from the clouds. The effect can be comic, and touching. It can also mean that the fine detail of what he’s doing sometimes gets lost in the big canvases of his songs and their cosmic concerns, and in the baroque arrangements. Last time around, the electro-dissonance of The World of Adz pitted itself quite deliberately against his previous work. This time round, Stevens does the opposite. He engages with his past, quite literally. For much of Carrie and Lowell the viewpoint is that of Sufjan-as-child, dealing with aspects of his abandonment by his mother. The fine detail is apparent this time, given that he’s pared back the music to the simplicity of the 2004 album Seven Swans that first put him on the map. By now, most people know that the new album’s title refers to his late mother Carrie, and to his stepfather Lowell Brams who runs the Asthmatic Kitty indie label for which Stevens records. Carrie had bailed out on her family when Sufjan was still a toddler ; she left them at the video store, as he says in one of these new songs. During his pre-teen years, Stevens had a brief period of regular contact with Carrie, but this tailed off as she fought a series of battles with manic depression, schizophrenia and drug addiction. Three years ago, she died from stomach cancer. Carrie and Lowell is where Stevens has decided to deal with her legacy, head-on. In other hands, this sort of project could have been a disaster. IMO, it does help to come to it with some grounding in his previous work. So, and while this article doesn’t claim to be any kind of definitive retrospective, the Seven Swans album is a good place to start. From it, I’ve chosen “He Woke Me Up Again” …it is a song about spiritual awakening, but there’s a current of menace there as well. The“ He” of the title could be (a) his stepfather (b) the prophet Abraham on his sacrificial mission or (c) Jesus. Take your pick. and He takes and He takes and He takes…. From the same album….‘The Predatory Wasp of the Palisades’ is another highlight. It may well be the definitive song about the intensity of childhood love, and the nostalgia it engenders. I come out wearing my brother’s red hat…. 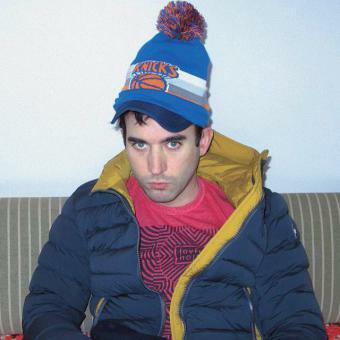 The “Predatory Wasp” is typical of Sufjan’s mid 2000s music, from the swelling orchestral passages to the sudden drops back down to his falsetto. The best version of the song happens to be this fantastic performance from the Austin City Limits TV show. Note how the members of the orchestra all seem to be left-handed. The angel wings that Stevens and Co are wearing are duh, a Christian prop. Less obviously, they’re also a nod to the outsider art tradition that Stevens has repeatedly championed. The World of Adz album for instance, was a celebration of the outsider artist Royal Robertson…. 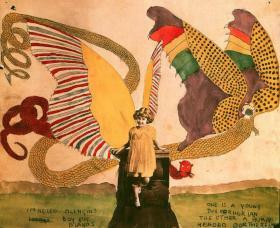 and note how similar Sufjan’s wings are to this illustration by Henry Darger, the compulsive writer, artist and janitor that Stevens had evoked before. Namely, in the song “The Vivian Girls Are Visited in the Night by Saint Dargarius and His Squadron of Benevolent Butterflies” on the Avalanches album of out-takes. With Sufjan Stevens, the Christian imagery is real enough, but he’s always using it in idiosyncratic ways. That’s certainly the case with his five-EP box of Christmas carols. This box set contains many, many new Christmas carols of varying quality, alongside his re-arrangements of everything from ‘Hark The Herald Angels Sing’ to two versions of ‘In Royal David’s City’ and three versions of ‘O Come, O Come Emmanuel.’ The best of his own Christmas songs e.g. ‘Get Behind Me, Santa’ and “Sister Winter” are great, however. Typically “Sister Winter” ends its dark, depressive passages with a shot of transcendental optimism and goodwill. Everything I feel returns to you somehow…. Dead, but waiting to be woken. In a sense, this brings us right back to where we started : with ‘He Woke Me Up Again’ …and with faith infusing us with the preciousness of life, even in the presence of death. I know, singer/songwriters always say that their songs are not autobiographical, and that these are characters they’ve created, not diary entries. However, this album all but begs to be taken as autobiography. In charting one artist’s battle with the family tradition of depression and self destructiveness he has inherited, it has universal value.